You’ll immediately see I don’t much care for regular benchmarking! The UK‘s at 3%, no Japan, no Europe…how on earth can he have no US exposure?! 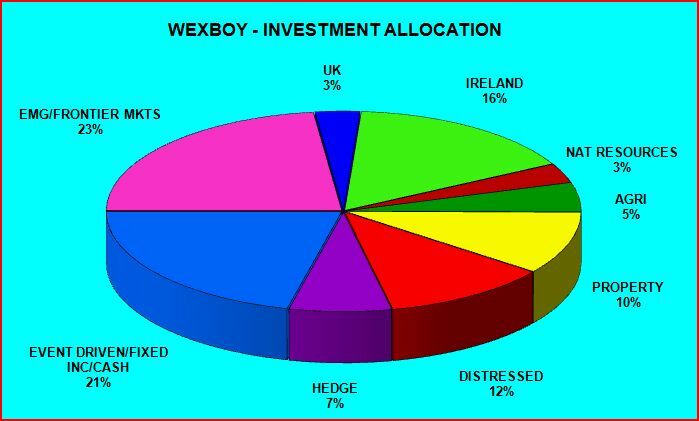 And what the hell’s this 16% Ireland exposure..?! Actually, zero US exposure isn’t quite true. But the US stocks I own, for example, are actually allocated to a different investment allocation (or theme), which I considered more relevant than geographic listing/location, in each instance. [Note: Allocating on a thematic basis is an excellent idea, but I recommend you don’t let it entirely dictate your perspective. Keeping an eye also (which I do) on allocations on a geographical listing/location basis is still of secondary importance]. Don’t be fooled either by the apparent fact my pure equity exposure accounts for less than half my portfolio. Yes, the major portion of my portfolio’s invested in what are usually termed alternative assets. Long term, I believe these assets can offer higher rewards and/or lower risk, and promise a more diversified/less correlated portfolio. But, in reality, this investment exposure is basically achieved via equities – i.e. stocks/funds. This means I may get a specific alternative asset thesis dead right, but still suffer significant near/medium-term pain & loss if equity markets deteriorate meaningfully. UK (3%): One of my biggest portfolio problems: I always seem to have a stack of new stocks & investment ideas lined up – another reason not to fool around with stock-screeners..! But you have to balance this with a sane number of portfolio holdings – for tracking purposes and, more importantly, since your best ideas need to be expressed via meaningful portfolio stakes (or you’re simply wasting your time…). Rationing is the only sensible answer – a rather painful (and never-ending!) relative analysis & ranking exercise to ensure all choices are considered…before actually making a choice! But a distinct preference for alternative assets, plus emerging/frontier markets, doesn’t bode well for my allocation to developed markets..! Couple that with a disregard for benchmarks (in the end, I answer to myself! ), and the pie-chart should begin to make more sense. Despite that, I’m a little ashamed of my current UK allocation (really just a couple of undisclosed toe-hold stakes). Why? Well, I recently wrote v positively about GBP and, for the same basic reason(s), the UK’s a great bet on Europe! Of course, you first have to decide if you actually want to bet on Europe..!? But, presuming you do, how do you go about it exactly? Sure, European valuations are cheap, but how’s the growth outlook shaping up? Well, it’s not..! [And btw: Is the US really a better proposition?! Perhaps its current growth & outlook look better right now – but that’s down to the ‘juice‘ in the system, and it’s offered at a much higher valuation anyway]. So buying a European index/fund is a real leap of faith right now. A valid alternative is to hunt for deep value opportunities in selected markets – that’s a perfectly sound strategy, and will appeal to certain investors. But for many readers, I’d argue that buying UK stocks is perhaps the most sensible/least stressful bets available on Europe. This skewing of the UK risk/reward proposition (in a European context) is exactly what I like to see!